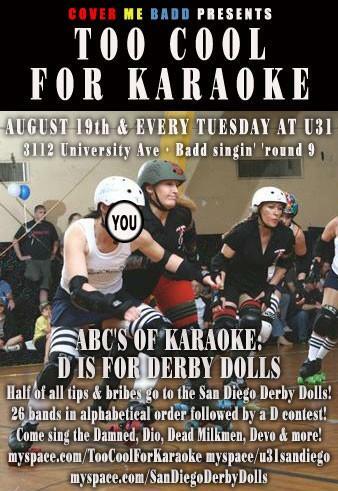 The San Diego Derby Dolls are having a couple fundraisers coming up to raise money for travel games. So far the San Diego Derby Dolls have had the opportunity to travel for bouts in Boise and Seattle… upcoming travel games include Sacramento and Denver. Please come out and support your local derby girls! Please come out of your hole for this one (though we know that it may take a few drinks). Are you Too Cool for Karaoke? This fine art has to be one of the Derby Dolls favorite pastimes. Please don’t miss out on lousy singing and more fun than you could possibly imagine! For now, save this date!!! There will be bands, raffles and general mayhem as the San Diego Derby Dolls take over the entire restaurant area of the downtown House of Blues venue.